The Independent National Electoral Commission, INEC, has asked the United Nations, UN, for its support to conduct a peaceful, and credible election in 2019. The chairman of the commission, Mahmood Yakubu said this on Monday during a meeting with the United Nations Team led by the representative of the Secretary General, Needs Assessment Mission on the 2019 General Election, Sergi Kubwimana. He said INEC needed support in aspects like technology, capacity building for staff, voter education and sensitisation and the electoral process as the 2019 election is fast approaching. The commission also said UN support would be needed to also help political parties in electoral conflict mitigation, inclusiveness, especially of women, youth and persons with disabilities. Mr. Yakubu noted how over the years, the UN had provided great support to INEC while trying to introduce and sustain reforms of the electoral system in Nigeria. He assured the UN of the commission’s commitment to conducting free and fair election. While enlightening his guest on the development so far in the electoral process, he said INEC has registered over 74 million voters, and promised that the number will rise. He also said the number of registered political parties now is 68 and the commission is processing over 90 fresh applications seeking registration as political parties. He also informed the visiting UN officials that there are 119,973 polling units, 8,809 electoral wards and 1,553 constituencies for which elections will be conducted in 2019. 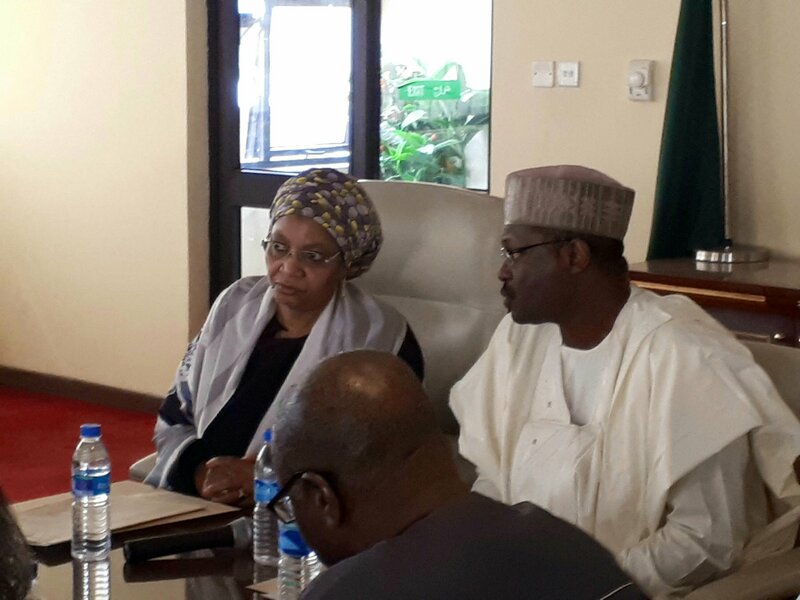 The INEC chairman told the UN delegation that in past elections, the commission had deliberately and purposefully embarked upon far-reaching reforms of the electoral system in terms of operational procedures. He listed the reforms as changes in voting procedures, enhancing the physical security; on the ballot papers, ballot boxes and result sheets, the reorganisation of the commission’s administrative structures, capacity building and professionalisation for the staff; instituting the long term planning processes; introduction of technology such as biometric registration and authentication process (permanent voters’ cards and smart card readers), collation and results management as well as the trafficking and monitoring of electoral activities. He also said in conducting the needs assessments, the UN would work with relevant persons and bodies including the security, political parties, civil society organisation, including women organisations and the People Living with Disabilities (PLWDs). “Women organisations are also an important aspect of our collaboration to see how we can increase representation of women in politics and also increase number of voters. Security is also important in any given contest,’’ he said.